Nice appreciation today in the New York Times of one of my favorite films, Dr. Strangelove. “Dr. Strangelove,” Stanley Kubrick’s 1964 film about nuclear-war plans run amok, is widely heralded as one of the greatest satires in American political or movie history. For its 40th anniversary, Film Forum is screening a new 35 millimeter print for one week, starting on Friday, and Columbia TriStar is releasing a two-disc special-edition DVD next month. 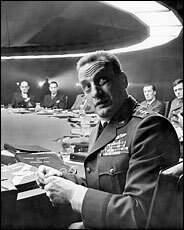 One essential point should emerge from all the hoopla: “Strangelove” is far more than a satire. In its own loopy way, the movie is a remarkably fact-based and specific guide to some of the oddest, most secretive chapters of the Cold War.